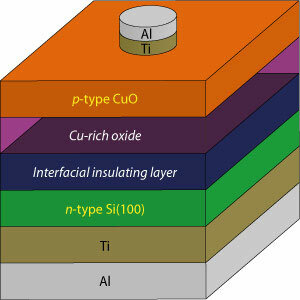 (Nanowerk News) By tailoring the interface between the two sections of a solar cell, A*STAR researchers have produced a high-performance solar cell from the abundant and cheap materials of copper (II) oxide and silicon ("p-CuO/n-Si heterojunction solar cells with high open circuit voltage and photocurrent through interfacial engineering"). For solar energy to become environmentally friendly and cost effective, the two main components of ‘heterojunction’ solar cells — the n- and p-type layers — need to be fabricated from nontoxic, abundant materials. Copper (II) oxide, also known as cupric oxide, holds promise as a p-type semiconductor since it meets both these criteria and also has an ideal bandgap for absorbing sunlight and a high light absorption. On paper, copper oxide and silicon are a perfect pair for producing high-performance solar cells. In practice, however, their performance has been disappointing because of the tendency of holes and electrons to recombine in them — a process known as charge recombination. This recombination limits the production of electricity in a solar cell since it reverses the generation of electrical charges from light. One cause of this problem is the poor quality of the interface between copper oxide and silicon as the result of silicon oxide on the silicon surface. Now, Goutam Dalapati from the A*STAR Institute of Materials Research and Engineering at Singapore and co-workers have used conventional procedures to produce high-performance solar cells that employ cupric oxide as the p-type material and silicon as the n-type material. They realized this by increasing the pressure during the deposition stage of fabrication, which they found enhances both the crystal and interface quality, thereby reducing the charge recombination rate. Using a sequence of analytical techniques — Raman spectroscopy, X-ray diffraction, X-ray photoelectron spectroscopy and high-resolution transmission electron microscopy — they showed that the interface quality was limited by the formation of a copper-rich oxide layer as well as by the production of a silicon oxide layer on silicon surface. Dalapati explains that the team were surprised by the formation of this copper-rich layer as the cupric oxide target contained an equal mix of copper and oxygen. But the scientists also discovered that they could minimize this layer by increasing the pressure during deposition and the annealing time. Using this tactic, the team successfully produced a high-quality solar cell that had a low charge recombination rate.